Epic Games has used its keynote at GDC 2017 to unveil new functionality in Unreal Engine’s VR Editor, including the option to edit meshes and animations directly within virtual reality. The company also announced that it is implementing Pixar’s OpenSubdiv subdivision surface technology and Univeral Scene Description format within UE4. Although the VR Editor has been included in UE4 since last year’s Unreal Engine 4.12, its functionality was relatively limited. While users could navigate a level and access key UI windows within virtual reality, they were otherwise largely confined to placing or repositioning existing static props. 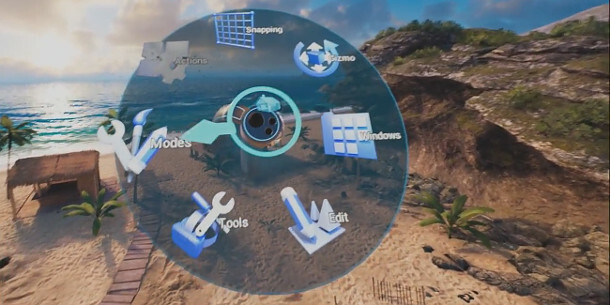 The new functionality looks to make UE4 a far more complete toolset for creating content directly within a VR environment, with Epic CEO Tim Sweeney comparing the work to Oculus and Google’s own art tools. “What Oculus Medium and [Google’s] Tilt Brush have done for painting, Unreal Engine is now doing for full-scale professional VR development,” he said. At 01:01:00 in the video at the top of the story, you can see Epic Games principal technical artist Ryan Brucks and tools programmer Lauren Ridge demonstrating the new functionality. The first part of the demo shows off new ways to navigate a scene in VR: as well as simply rotating the view camera or teleporting between viewpoints, you can see Ridge moving around using what look like the VR equivalents of climbing hand over hand and pinching to zoom on a touchscreen. There is also a new radial menu (above), which provides access to all of the editor’s key tools and interface windows: the demo shows the foliage painting UI from desktop mode being used within VR. Other new features within VR include Simulate mode, which enables users to place objects in the scene and have them redistribute themselves under gravity, as shown at 01:02:55 in the video. Blueprint events can also be triggered inside Simulate mode. The engine’s Sequencer cinematic editing toolset is also now accessible within VR enabling users to bring up the same interface window as in desktop mode, and edit tracks and keys directly within virtual reality. Animations can also be played from the radial menu, and edited by manipulating objects directly: at 01:04:20, you can see Ridge change the flight path of an airplane by pausing the animation and repositioning it. But perhaps the biggest new feature is the new mesh editing toolset – you can see at 01:05:00 in the video – which enables users to model new geometry within virtual reality. The demo showed a range of simple extrusion and other polygon editing operations, although Epic says that it only showcases a “small subset of the features we plan to add with mesh editing”. There is also a new Smart Snapping system, which does pretty much what the name suggests, snapping one object automatically to another, speeding up the process of assembling scenes from modular geometry. Epic Games also announced support for two key open-source technologies within Unreal Engine. The first is OpenSubdiv, Pixar’s high-performance libraries for real-time subdivision surfaces; the other is its USD scene description format – also supported, via plugins, in Maya and Katana. The latter provides a route for importing readymade scenes – including complex visual effects or animation assets – into UE4. 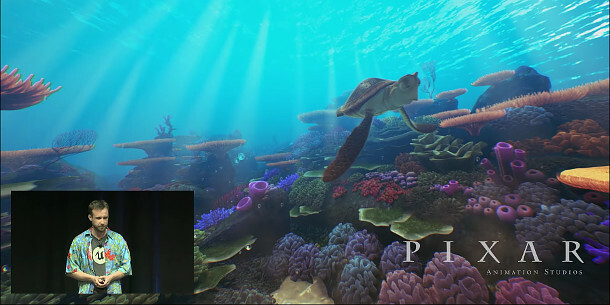 At 01:08:25 in the video, you can see a scene from Pixar’s Finding Dory imported into Unreal Engine for viewing in VR. The demo uses the original production assets, which are tessellated and rendered in real time. The new VR toolset is currently available as a public tech preview on GitHub, including full source code. Unreal Engine itself is available for 64-bit Windows 7+, Mac OS X 10.10.5+ or Linux. Use of the editor is free, but Epic takes 5% of gross beyond the first $3,000 per quarter for any product you release commercially.